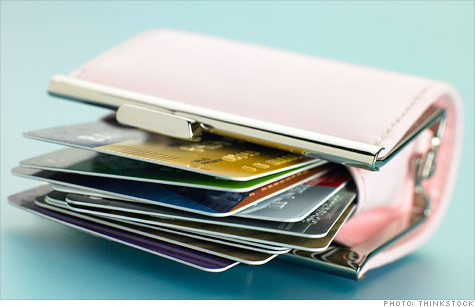 NEW YORK (CNNMoney) -- Consumers are racking up credit card debt like it's 2008. Americans added $18.4 billion to their debt load in the second quarter, a 66% increase from the debt they accumulated in the same quarter last year and 368% more than they tacked on in 2009, according to credit card research firm CardHub.com. In fact, the last time consumers charged up this much debt during this time period was in 2008 -- several months after the recession officially began and when credit card balances climbed by $25.2 billion. Despite the recent spending spree, the total amount of credit card debt consumers have accumulated is still significantly lower than in previous years. Total outstanding credit card debt as of July was $792 billion, down 18% from the September 2008 peak of $972 billion, according to data from the Federal Reserve. If current trends continue, however, consumers could find themselves even deeper in the hole. CardHub, which analyzed the consumer debt data from the Federal Reserve, estimates that consumers will run up about $54 billion more in credit card debt by the end of 2011 than they did in 2010. Helping to fuel this renewed reliance on plastic are the credit card issuers, which have started to loosen their standards and extend credit to consumers with so-so credit again now that government regulations like the CARD Act and the debit card swipe fee cap have been finalized, said SmartCredit.com credit specialist John Ulzheimer. "Credit card issuers have a better feeling of where things are going to be legislatively for the next few years," said Ulzheimer. In addition, debit card fees and disappearing debit rewards programs have driven many consumers back to plastic, he says. "New fees on debit cards are making credit cards even more attractive -- and it's much easier to be irresponsible with a credit card." While consumers may be racking up more debt, they are at least defaulting less frequently and getting better at making on-time monthly payments. Late payments and defaults dropped significantly among major credit card issuers, according to August regulatory filings of major credit card issuers, including Discover, Bank of America and Chase, compiled by credit card comparison website Lowcards.com. Yet, credit card companies may be getting ahead of themselves and offering better deals on their products than they should to consumers with shaky financial situations, said CardHub CEO Odysseas Papadimitriou. "Some consumers, rightfully so, take advantage of these offers and use their credit responsibly," he said. "However, another group of consumers will jump at these products and increase their debt to pre-recession levels even though their income does not justify it." And since overleveraged consumers put the economy into such a financial mess in the first place, an uptick in delinquencies and defaults may be on the horizon as well. "We're making payments on time -- so what? Delinquencies and defaults will follow the debt," said Ulzheimer. "It's obvious we still haven't learned our lesson." With the Black Friday and holiday shopping season right around the corner, consumers aren't likely to slow down their spending anytime soon -- and their debt loads will head even higher, said Ulzheimer. But once New Year's comes around, debt levels usually take a temporary dip as consumers make a resolution to throw away their old spending habits -- or cut up their credit cards. Check out these six new tools to help you crack down on your debt.